I made this card a few weeks ago and thought the beginning of April would be a good time to share it. This was a snap to make -- trim the patterned paper, stamp the sentiment, color this Penny Black Together stamp with markers, stamp, redo to add shading, and add to an A2 card. Love the combination of bright pink with the Modern Graphics black dotted paper -- wish I could buy that paper in bulk! 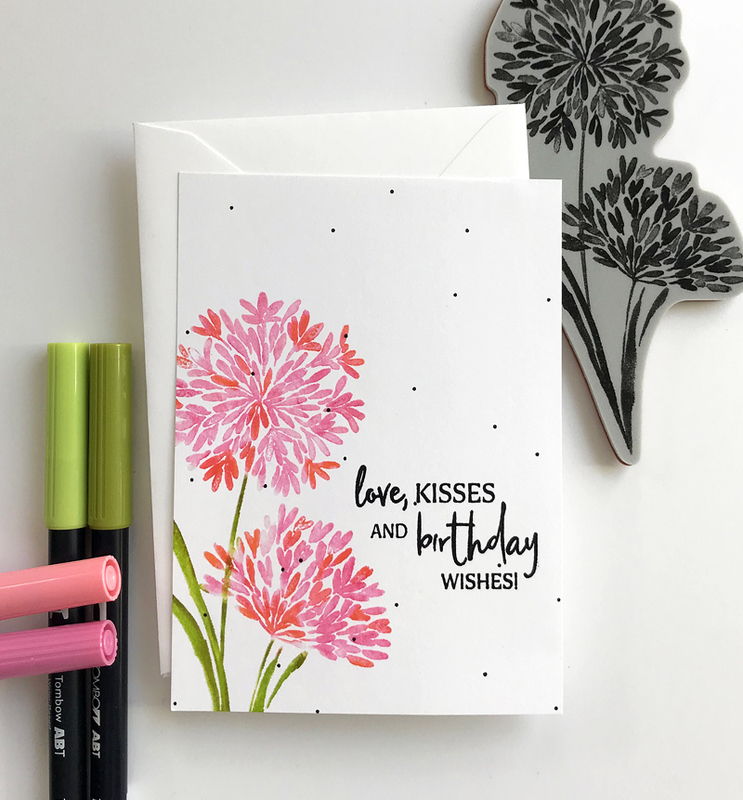 Supplies: Penny Black Together; Penny Black Good Wishes sentiment set; Modern Graphics patterned paper designed by Julie Ebersole; Tombow Dual Brush Markers. 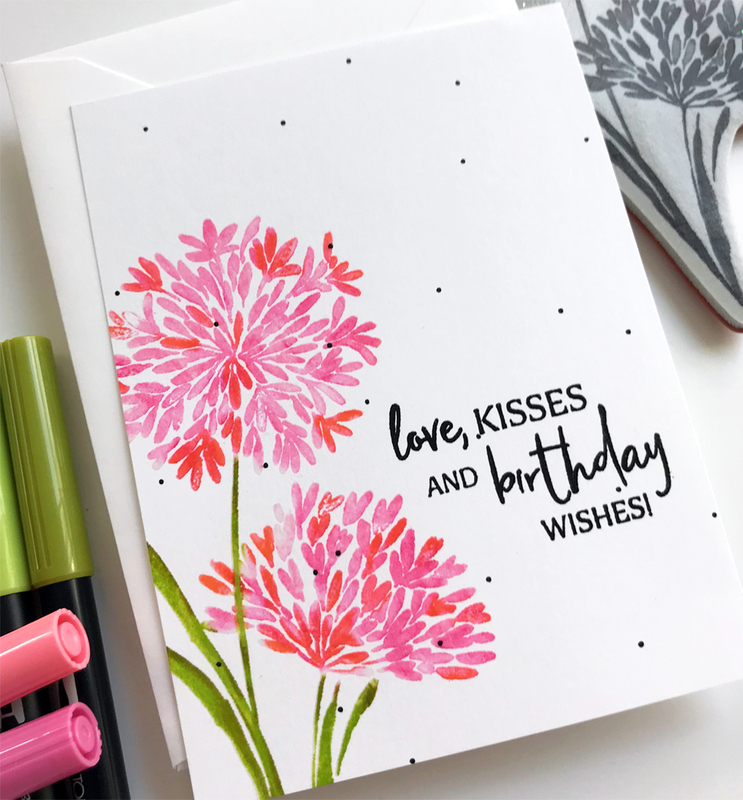 (Penny Black let me pick out some stamps from its current Timeless collection and these are some of my favorites from that collection). MOOD WHEN DONE: Hanging in there. I've pretty much recovered from the surgery to implant the defibrillator. I can start driving again in a few days and can start wearing clothes that have to go over my head to put on (it's the little things). Yeah! However, to be honest, every heart thing leaves me a bit depressed. Not depressed as in I need a doctor, but just a little down. I guess it's that whole life/death thing and being away from so many friends. I'm keeping busy (seriously, this hobby saves me), which is always the best medicine. Plus gratitude for everything I have lifts my spirits. Just writing that sentence helps. Thanks for listening! Your card is fabulous. Love those random black dots. THe bright colors of the bloom stand out nicely in a cheery way. Sending hugs. This is beautiful, Joan! I LOVE that you stamped the flower on the dotted paper- that just makes it!! I am so sorry that you have been feeling down. Medical things are sometimes just too much emotionally and make us think TOO much (says me, an total overthinker!!). Thinking of you and sending you hugs!!! I love everything you do with these Penny Black stamps, Joan. This one is especially pretty. Cute with the teensy dots. You're entitled to feel a little down, but you always rally and I admire that about you. My little LuLu has been limping and only getting worse, so I took her to the vet and found out she has arthritis in the knee and ankle joints of the leg in question. Nothing to be done but pain management and she's supposed to be restricted from the exuberant Great Outdoors running she enjoys so much. I can't tell you how depressed and nonfunctional I was for a couple of days. I've been giving some thought to the situation and am in better spirits now, but the point is I feel pretty wimpy compared to what you've been through. I have confidence in your strength of spirit. I’m a new admirer of you work. Love this card and the bright cherry flowers. Hope you find more things to cheer you along and keep inspiring others. Best wishes. Love this flower stamp, love the colors you chose, love that black-dotted paper! Sending you good wishes about your heart issues. You are so right that gratitude is the key--feel thankful for the things and loved ones you DO have, not wistful for the things you don't have. All best to you! Lovely! I'll keep listening - and thank you for sharing! Most blogs that I follow I just look at the pretty card in the thumbnail on feedly and move on but I always click through to yours because I love your writing just as much! Love your card and stamp, and how you have used it - CAS! We'll keep listening, so do carry on whenever you feel like it! I think it's probably an age thing too!!! Happy to see you in my inbox. I'm always inspired by your creations. Gratitude and thankfulness are very healing and heart healthy. I urge you to let nature sing to you. Your card sings to me. Praying for your well being. Take good care. Your beautiful cards always lift my spirits, and I’m glad they do the same for you. Thank you for sharing your hopes and your life with us. I am always so thankful for one of your posts in my inbox. Such a striking card! Beautiful pinks on the dotted paper. I have so enjoyed your learning tutorials. I have long admired Jill Foster. She is incredibly talented. Can't say I can come close to what she does, but I continue to be inspired. Very impressed with all that you have learned. Fresh and lovely, Joan! I *adore* oranges and pink tones together, though I'm not generally an orange fan otherwise--weird, I know! What a great card Joan! So fresh, and vibrant. This is one of the prettiest cards I've seen lately. The simplicity of it and the pretty pinks along with that dotted paper is so much my style, too. I love the way you placed the Penny Black flower stamp on the left side of the card. I tend to want to put everything in the middle so thanks for that example. Breaking News! Patent Pending!! Giveaway!